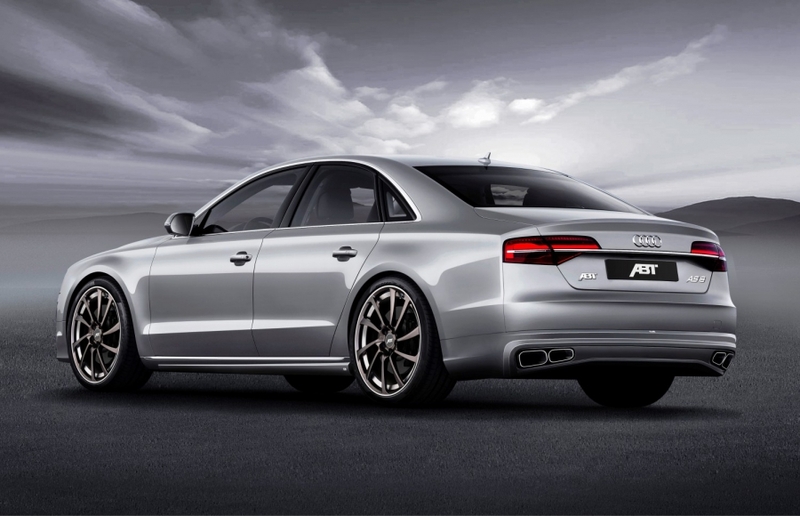 20 years ago, the Audi A8 cut a dash in the German premium class and firmly established the company there. And if you needed even more exclusivity or horse power, you could always ask ABT Sportsline. On the occasion of this anniversary, we again provide an extensive upgrade for the A8’s third generation’s Facelift variant. For a high-end limo, elegance is of prime importance. Therefore, we have opted for an aero package whose stylistic features convey both sportiness and elegance. With a dynamically curved front spoiler, ABT Sportsline artfully breaks up the rather cross-lined front. New side skirts make the very staid serial silhouette appear much more interesting and aggressive. The rear skirt set, curved near the exhaust, also makes for an exciting look and underscores the four tail pipes’ arrangement. The visual kicker is that the inner outlets are smaller and of a slightly different geometry. Less static, more dynamic, is how you can describe our package, and that applies to more than just the looks! We also provides various ABT Power “New Generation“ upratings. With its separate control unit, specially developed and extensively tested by us, and its software, these are ideal for modern high-tech engines. 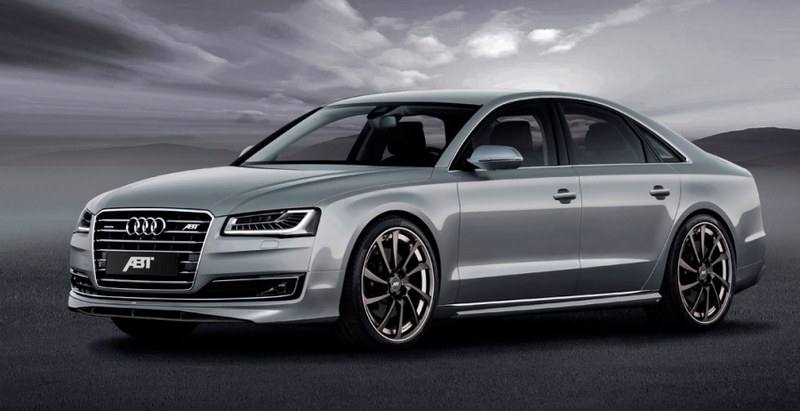 Owners of petrol-powered Audi A8s will enjoy the 4.0 TFSI upgrade, which turns 435 hp / 320 kW and 600 Nm into no less than 540 hp / 397 kW and 720 Nm. Diesel fans and their 3.0 TDI will now be able to use 300 hp / 221 kW and 640 Nm instead of 258 hp / 190 kW and 580 Nm. For the brute V8 diesel, ABT Sportsline has seen to results you otherwise see in a truck: the 4.2 TDI’s 385 hp / 283 kW and 850 Nm are turned into an enormous 430 hp / 316 kW and 920 Nm. The Audi A8’s handling, perfect to begin with, is made even more perfect, if you will, by an electronic lowering module. 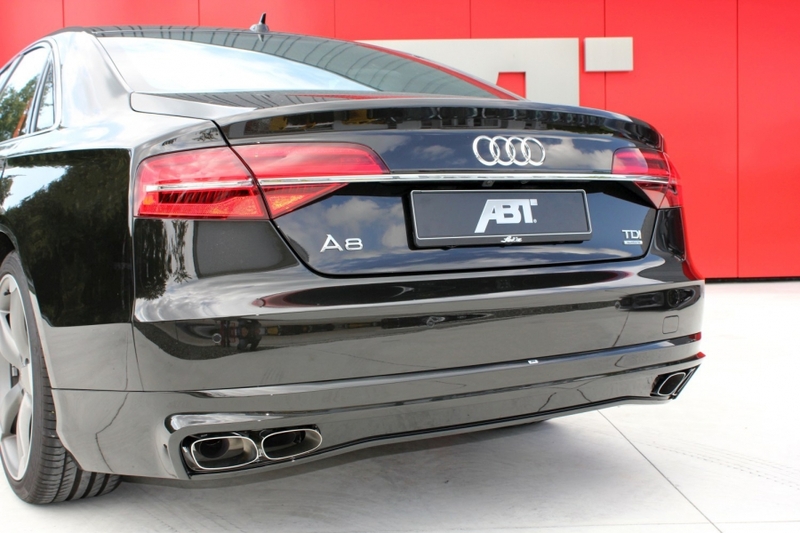 The ABT Level Control lowers the car by 25 mm, front and rear, which benefits both the car’s cornering capabilities and looks. And it makes ABT Sportsline’s alloy wheels stand out, too. The car in the photo features the ABT DR in “Gun-Metal“ with a machine-relieved well. The wheel is available in 20’’ and 21’’ and also in “mystic black“. Another interesting variant is the ER-C, available in 19’’ and 20’’ and with “silver bullet“ and “Gun-Metal“ finishes. official fuel comsumption ABT A8 /100km:combined 9,1-5,9; CO2-emission combined, g/km: 213-144.